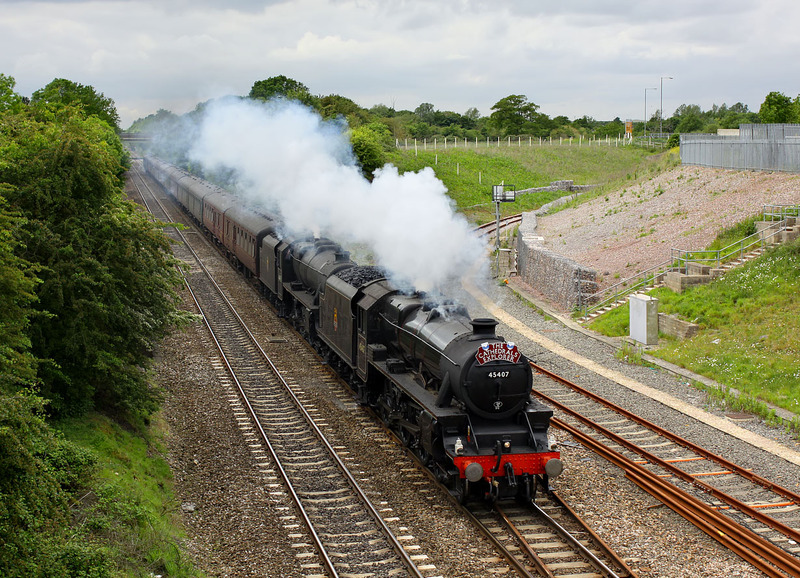 'Black Five' 4-6-0s 45407 The Lancashire Fusilier & 44871 pass South Marston on 13 May 2011 with the Steam Dreams 1Z27 09:20 Carmarthen to Victoria 'Cathedrals Explorer' railtour. From Victoria the tour would travel on to Canterbury and then back to Kensington Olympia behind former Southern Railway pacific 34067 Tangmere. This was the final day of a mammoth eight day tour of the United Kingdom, featuring a wide variety of locomotives. The track leading off to the right in this picture leads to Swindon's Honda factory.